Ramblings or rumblings at life is a pretty word. Come back (almost) daily for more. This description of buoyancy has come to my attention twice in the last 24 hours. While chatting with a fellow collaborator, she pulled the Porcupine Spirit card from an animal oracle card deck. Porcupine quills are filled with air and will float on water. By staying open and curious, rather than defensive, we can swim rather than sink. Then, rereading the Trust chapter of "The Seat of the Soul," the "personality that is engaged in the work of its soul is buoyant," jumped off the page. Message received! So off I go today with curiosity engaged. What might happen if you did also? It's been 15+ years since my daughter died. Her picture, next to the bed, gets a kiss most nights. Long periods of time will go by with no dreams of her, no mention of her name. And then suddenly there'll be a burst of Lena-energy to boost my spirit. Over the last week, I received a surprise gift from a new friend who just learned of how much we miss Lena, a Facebook message from one of Lena's high school friends who's still coming to terms with what she meant to him and took the time to share his thoughts with me, and hanging her violin Christmas tree ornament brought a flood of Suzuki lesson tunes swirling through my head. All these things add up to a heart full of love. What touched me the most though was the lengthy, heartfelt, and detailed message from her high school friend. There is nothing a mother loves more than hearing stories of how her child loved the world and left her mark on others. I'd never heard from him before and yet, he'd been showing up throughout his life with guidance from his memories of her and the impression she had on him. This season, tell your stories. To the mothers, to the siblings, to the friends. There can't possibly be a reason to hold back. Any tiny tidbit can spark memories, joy, love, and laughter. If there are tears, not to worry. Those are good for the soul too. So please, tell us your stories. It's a free act of kindness that feels priceless and so very precious. Choosing love over fear happened to be the central point of a chapter I was reading today in “May Cause Miracles” by Gabrielle Bernstein. Although her point was concerning the ego’s role in body perception, I was more interested in applying this sentiment to everyday life. Because until I choose love, nothing gets done. Of course, when I choose to love my work, every roadblock or problem finds its resolution even if the result doesn’t closely resemble my original vision. I love how the work evolves along with my learning, acceptance and problem-solving. This happens all.the.time. And still, the work can be satisfying, sometimes extraordinary, and always magical. Just as I was finishing this blog post, a creative person I follow online (Jamie Ridler Studios) sent her newsletter with the title “The Power of Discontent.” She used the Edison quote in her post, which I thought was especially fitting so will post it here also. For a time this past beastly hot Florida spring and summer, the way forward wasn’t clear despite all the plans I'd made. I needed to strike a balance of planning well, mixed with practice, trusting myself and the others who guide me, but not over planning, leaving some things to chance and a sense of play, all while holding my vision of (my too precious) outcomes. Let me be more specific. When I practice painting a piece of artwork on scrap paper or inexpensive canvas boards, my "studies" turn out fairly well. But when approaching the big canvas, which may be blank or may be a hot mess from earlier trials, I often freeze. Of course, losing the sense of just playing around and suddenly attaching all sorts of expectations to the work is the antithesis of creativity. Having finally begun to recognize when this is happening earlier in the creative process, I laid the troublesome canvas flat, grabbed a crummy old cheap brush, and squeezed paint direct from the tub onto the surface. Mixing the colors with rhythmic brushstrokes back and forth, again and again, telling myself, "All you have to do is lay down color. Fortunately, the fissures and bumps from the earlier botched effort came through in just the right places to for this landscape scene. A place desolation and enduring light. A place where the winds of absolute discontent drive me onward. If success is stumbling from failure to failure with no loss of enthusiasm is true, then I'm definitely in a failure slump. Recently, more than one creative project has left me feeling disappointed and again wondering why I bother to create anything. I know all the answers to that question, having been here before, but when you've invested months of effort and your "how am I gonna salvage this" plan lacks passion, what's one to do? Soon I'll be visiting friends and family in another state. A change of scenery may do the trick. Walking away may create a clearer perspective. At the moment though I see only dark clouds. In the big scheme of things, I understand this moment means nothing. There are far greater challenges in the world. And that makes me want to cry too. Recently we asked for suggestions on where to expend funds from the Lena Kay Rufus Memorial Scholarship Fund in the areas of education and literacy, both near to Lena's heart. The community surrounding life is a pretty word and Hoofen Floofen Island came through with so many options, I had to start a spreadsheet. It was exceptionally rewarding to hear of so many organizations doing good work across America. A pleasant change from the sometimes dismal daily news. CESA 12 (Cooperative Educational Service Agency), provides a Young Author's/Writing Workshop program through the Gifted and Talented initiative. Students in grades 3-12 participate throughout the school year learning to storyboard, develop plot and characters, and the technical aspects of creating a book. This grant will support these students and the educators' efforts. WITC (Wisconsin Indianhead Technical College) Foundation, provides a Student Emergency Fund to help learning adults stay in college when financial trouble happens. Paying for an unexpected car repair, a tank of gas, or groceries in the refrigerator can make all the difference in making ends meet and whether a student's education can remain a priority. Thank you for your part in making these gifts possible. The possibilities are nearly endless when we believe in ourselves, and indeed it is the first step when trying something new. Until a few years ago, I didn't believe in my ability to write publicly, put brush to canvas, or to live as minimally as possible while traveling extensively. And I never would have thought by using soul cards I could find the focal point of a self-discovery and creativity practice that would lead me to create a card deck of my own. And yet, here I am with newfound insights and clarity as a direct result of making those creative marks, which have left their imprint on me. I'm creating my inspiration deck as one of several creative projects honoring 2018 as my year of Now. It is the word I chose (or perhaps it chose me) to guide my creative path after many years of processing life challenges. This is the year to switch things up. It turns out, creating a card deck is a rather intense process with many aspects; the least of which include listening more attentively to myself and others, taking stock of past creations, being honest about my abilities, recognizing fear in its many forms. And most importantly, taking a long look at my intentions. Having completed a year of travel after producing the Hoofen Floofen Island children's story, what better way of honoring this year of Now than by creating an inspirational card deck I'll return to again and again whenever I need a nudge ... which is almost daily! Pulling a card is the first thing I do with a full cup of coffee. Its a fun and helpful exercise to ease into my day. If all goes well, it won't be long before the deck will be available to you also and before you know it, you'll be expressing yourself and honoring all the feels. Join the list here, and you’ll be the first to know when the Bright Soul card deck is ready! When a pathway opens, do you recognize and honor it? How does one know when its the best path or whether its yet another distraction? Some people say you'll know in your heart or you'll feel it in your soul. While I've certainly sensed and honored that "knowing," more often I don't know. Rilke's quote feels especially relevant as we settle into a more traditional lifestyle after a year of travel. I'll be challenged with keeping the flow going while remaining still. And after returning from yet another epic Caribbean trip in April (apologies for my extended absence from here but it was awesome!) and a short local camping trip, the voice in my head kept asking, "Why aren't you creating?" It is always a pull and tug, isn't it? Finding the balance between household chores and honoring the creative self. I'm thrilled the pendulum is swinging to the right brain and how good it feels sketching scenes from our travels, learning to use graphics tools, and developing a soul card deck. What are you creating today? When nothing goes right, go left. A change in direction can freshen your perspective. Rename the issue, reframe the problem, resurrect what you've tossed aside. Imperfect solutions that may be the nudge you need to merge onto the freeway that is your life. Think big. Reach for the sky. The sky's the limit. To infinity and beyond. Great advice, even if cliche. Why do we look up anyway? We may find answers, connect with Spirit or witness Mother Nature revealing her grandeur with a magnificence that dwarfs even the most narcissistic among us. We continue with grand or small steps, with determination following failure, disease, tragedy, and disappointment because looking up triggers hope, renewal, change, At least it does for me. And what does the continually shifting perspective of passing clouds ask of us? Only that we grab hold before it's too late. CITY TAKES AIM AT DERELICT BOATS was the headline in our small town monthly. You may feel sorry the boat fell on hard times. You could speculate on what the boat did wrong. Or you might be curious about the myriad ways we skirt social or community issues. Beat around the rocks as it were. If we aim at the boat, do we minimize the vessel owner's dereliction of their marine responsibilities? Is it merely the editors' headline tactic to get attention or are they preventing offense by labeling inanimate objects rather than people? When we're trying to make a point, how do we balance diplomacy with truthfulness? If we soften the accusation, do we care less or more? When I use discretion in daily life, am I doing better because now I know better (as Maya Angelou teaches us) or am I better at caring? The light of day is saved beginning at 2:00 a.m. today, this Spring's official daylight saving time. Are you in the what a bunch of hooey crowd or do you like it? To my thinking, it is an absurdly egotistical trick of an entirely human construct. Time, a human invention, wasn't good enough. We want more and better quality. Instead of recognizing the prison we put ourselves in, we've found ourselves bending our rules to suit our imagined needs. And somehow believing we'd saved time. For what, I don't know. Later use? If there was a time bank, would we put our savings to good purpose or hoard it until we have yet another populace of haves and have-nots? The benefits of travel, whether cross country or within your heart, begins at the first step. All await their turn to light you up or scare the daylights out of you. Where will you go this time? Do you know you've already begun? Can you ride the wave all the way to shore? Godspeed, dear ones. Perhaps I'll see you there. You've probably heard of choosing a word for the year rather than writing an agonizingly long list of goals you're unlikely to achieve. My current word is NOW. I selected it a few weeks before stumbling upon Eckhart Tolle's "The Power of NOW" in a lovely little neighborhood bookstore in Mt. Dora, Florida. This book isn't the sort you read over the weekend. It requires study time. At least it did for me. I found myself rereading paragraphs continuously. And making extensive use of my neon highlighter on nearly every page. And yet, I didn't want to put the book down and spent time with it every day for weeks. It became a fascination studying my mind and what it's thinking. I had fun. How weird, eh? "You may not be happy, but you will be at peace." This quote resonated and became a central point while working through the annual planning I've been doing of late. Over the past year when I've talked about my intentions to shift from bereaved mother to joyous mother (which frequently brought a smile to loved one's faces), something didn't sit right with my comments. So when I read the quote in Mr. Tolle's book, I think I said out loud, "That's it!" I never (yes never) think of myself as a joyous person. And not only since my daughter died. I've always felt this way. The "happy happy joy joy" personality I so enjoy seeing in others has eluded me. This doesn't mean I'm never happy. But now I'm recognizing I'm often at peace. Intangible yet immeasurable, collecting experiences suits me. Hubby and me, we make a good traveling team. Having named ourselves the Traveling Swordsmiths, we set out to see the USA over the last year fulfilling a lifelong dream. Fully expecting to use the extensive amounts of free time to write lots of blog posts, create a travel journal, and send daily postcards contributed to feeling some disappointment when, upon returning, found many blank pages yet to be filled. This stage, winding down from months on the road, had me feeling lost, longing for a map, and wondering what's next. After all, wasn't one purpose of the road trip supposed to answer that? Having seen, heard, and tasted much, how could these experiences be put to use? What to do with this expanded form of being? Make plans, of course! Follow a process. Or better yet create a different method. Using Sunday afternoon workshops, daily meditation, phone calls to friends and coaches, reading written journal looking for the patterns of the most energized entries, helped dissipate the sense of not having done enough. Then taping sheets of watercolor paper to the wall, opening pots of colorful paints and markers further created a shift from the typically dry, linear, left-brain analysis to a more creative, artful plan of action. A plan of such clarity and value, one can't help but get behind it. Er, in this case, get on it. Let's go! The Spanish moss is exceptionally fine on this steamy morning walk about my quiet neighborhood. With a mile to go before returning to the second cup of coffee waiting for me, an old woman driving a golf cart approaches. Just before turning down a side street, she whips a U-turn to come alongside me and says, "Hey, did I ever show you the tree that grows shells?" I stopped momentarily to say, "What? Who are you?" She ignores my questions, points repeatedly and demandingly to the passenger seat and says, "C'mon, get in. I'll show you. Get in! C'mon!" I slowly shake my head sorting out whether I should see this phenomenon or keep walking when I notice the gallon gas can on the passenger seat floor and imagine the regret I'll likely experience when it spills over my feet from her erratic driving. Again, shaking my head no, and returning to my walk, she hollers, "Never mind! You're a dud!" She accelerates down the side street of her original intention, and I hope that whomever she bullies next won't be called names for lack of cooperation. As she drives away, I note the rather unhappy brown teddy bear strapped in the back seat looking at me, and suddenly I'm pleased with my decision. Am I a dud? Apparently, some think so. We are often quick to judge, myself included, especially when we perceive someone is uncooperative. I may or may not have ungraciously retorted as she disappeared into the morning mist. There may have been pickled relish trays on the employee Christmas banquet tables that evening in December some twenty years ago. I don't recall. I do remember feeling full of the holiday, the season, and later, that celebratory night, delight mixed with reticence at being the focal point of the traditional after-dinner skit--a modified and fun reenactment of "To Tell the Truth." Do you remember that mid-twentieth century TV sitcom? Its where contestants discover which of three persons (two are imposters) is the real personality. The guessing game ends when the moderator says, "Will the real so and so, please stand up?" The characters taunt the audience a minute longer with false attempts to stand. Eventually, the real person rises fully revealing their identity. So often we can't or won't see ourselves as we are. Blinded by doubt or longing to be something other than our most authentic selves, we look to trusted friends for reassurance. Is there a better way of knowing oneself than having our good friends' qualities reflected back to us? Near the end of the banquet table, there are no more chairs. It's where the life-long quest to define who or what or how we are in the world, isn't an empty, pointless, and unfruitful endeavor or nearly as uncomfortable as we thought. It's the end of the table where they've placed the most sumptuous desserts, and it is where we've found our best selves standing. Instead of hesitation, there is sweet, courageous independence of telling our truth. "Connect with others whether or not they love you." Another excerpt of my manifesto has me thinking of my reactions when discovering someone doesn't "like" me. It could happen for the things I talk about or some quality they find me lacking or I don't fit their target audience, or they just liked me in a use-me way and then dumped me once I've met their needs. And, to be honest, perhaps this is how I've created frenemies too? So the challenge is to recognize when I'm complicit in the lack of love and my response to it. "Contribute something regardless of its scale." That first sentence of my manifesto, written with the intention of motivating creativity without being held back with my typical excuses. The thing isn't grand enough. I've never done X before. I should research further. That won't work because of any number of unfounded fears. Maybe its the cold winter months coming on, the slide into the dark season that has me second-guessing. Or perhaps I'm getting more creative with my excuses! The tender seed of thoughts and ideas need light and air. The least I can do is place them in a sunny window and observe what happens. 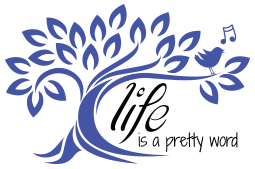 Our mission is to encourage and inspire you to mindfully honor your heart, soul, and emotions following a loss. This site is a tribute to a beautiful, loving, and talented young woman who once scribbled on a scrap of paper life is a pretty word. DISCLOSURE: Some of the products or resources mentioned or recommended on this site may include affiliate links. I may receive small compensation if you make a purchase from an affiliate link. You will never pay extra for the purchase.